The 1960s vintage concrete and glass curtain wall structure, which houses the Math and Social Science Departments, underwent a complete renovation. The main purpose of the modernization was to bring this 50 year old building up to date in terms of smart classrooms, complete utility upgrades, and design for sustainability to exceed Title 24 Energy Efficiency Standards. The exterior scope of work included window replacement, brick restoration, and accent painting. 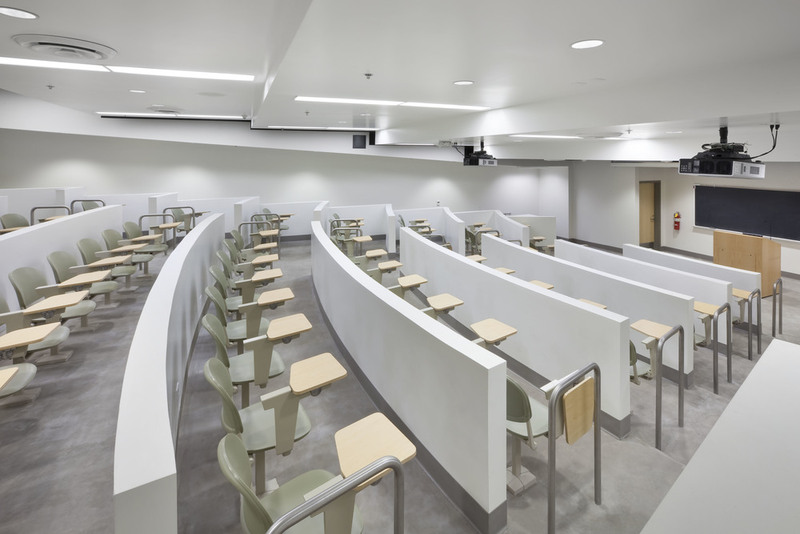 The interiors package included a comprehensive upgrade for smart classrooms of the future such as computers, projector screens, visual smart boards, and audio/visual equipment. The modernization also included the design of an energy efficient HVAC system, plumbing upgrades such as drinking fountains and restrooms, and new electrical service to the building including main switchgear, lighting, and low voltage. Although the project did not pursue LEED certification, the principles of sustainability were strictly followed throughout the design process in order to achieve a high performance building. For example, the design called for operable windows for natural ventilation, double pane windows to reduce heat gain, lighting controlled by photocells and occupancy sensors, centralized HVAC system with VAV terminals & economizers to maximize energy efficiency, and the use of Environmentally Preferred Products (EPP) for architectural finishes. *Principal-in-charge and Architect of record while at gkkworks.